Our school relies on the generous support of many caring donors living throughout the world. Some donors make a financial gift once a year, our annual fund campaign is coming up again this November, and others give monthly to support the continued education of our beautiful students. We are blessed to have such a strong and loyal network of support. Today we are profiling one of our longstanding donors, the DeVoe-Talluto family from Vermont who had a life-changing experience in 2008 when they moved to San Marcos for a sabbatical. You’ve said that while Vermont is your home, a piece of your heart has remained in Guatemala since your first visit to Escuela Caracol in 2008. Tell us about your connection to the school. Kristin DeVoe-Talluto: My husband and I travelled extensively before we had kids and we met some amazing families who were on the road with their children. We told ourselves that when we had children, we would do some sort of overseas adventure with them. Ten years and three kids later, we were ready to set off, but weren’t sure where we wanted to go. By happenstance we discovered Escuela Caracol, and even though our children were not enrolled at a Waldorf school at the time and we had never been to Central America and didn’t speak Spanish, we knew that this was the meaningful adventure that we wanted for our family. Escuela Caracol was only two years old when we arrived in 2008; there were two open-air classrooms, a small team of local and international staff, and 26 students (including my three!) in grades K-2. We were warmly welcomed into the Caracol community, and we loved the school so much that we kept on extending our sabbatical. We originally planned to stay for six months, but we ended up living in San Marcos for nearly a year. What was that year like for your family? It was truly a gift. 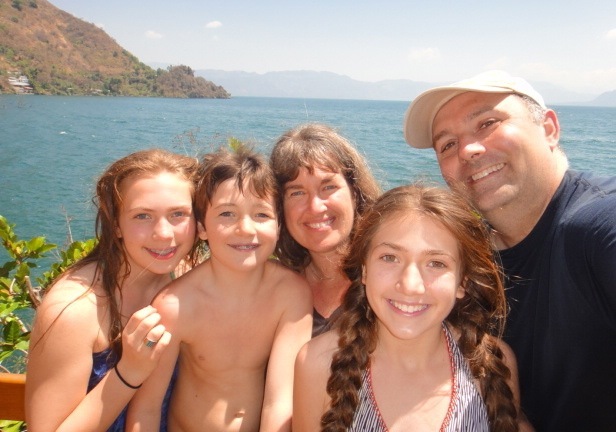 To experience the power of Escuela Caracol and the beauty of Lake Atitlan on a daily basis was inspiring. Because of our time at Escuela Caracol, we developed a deep appreciation of Waldorf education and enrolled all three kids in the Lake Champlain Waldorf School in Vermont when we returned to the States. For years, we dreamed of going back to Caracol, and finally last February we were able to return to volunteer and visit. We were in awe at how much Caracol has grown and matured, and yet it was also clear from watching the students and the teachers, staff and parents that the commitment, joy and vision that defined school community in its infancy remain the same. You’ve been a donor since you first connected with the school in 2008. Why do you give consistently to Escuela Caracol? My family decided five years ago to make Escuela Caracol our highest giving priority. We intentionally donate to the operating fund because we have the utmost confidence that our gifts will be used thoughtfully and strategically. We also know that our contributions will have an enormous impact on individual lives and by extension the whole community. In addition to our family’s donation, my daughters fundraise for Caracol each holiday season. Giving to Caracol is our way of affirming what is good and beautiful and whole in the world. It is my favorite check to write! Why are you so passionately committed to Escuela Caracol? I see Escuela Caracol as a beacon of peace and unity in a town that experiences intense poverty and vast divisions among the indigenous, ex-pat and tourist communities. Caracol’s ability to integrate education in a in way that honors the indigenous Maya as well as the children whose parents have North American, European and Latin American backgrounds speaks to the creativity of the staff and the wholeness and universality of Waldorf education. If you have ever been to Escuela Caracol or seen pictures, you’ll know that it is simply a stunningly beautiful place, and yet eight years ago it was only an idea and a piece of rocky land. For me, Caracol is an exquisite reminder of the potential in each of us, no matter our background, our language, or our economic means. I truly believe that the school serves not just the children and families of San Marcos, but also those of us around the world who yearn for models of vision, hope and love in action. May we learn to transform our own communities by practicing what Escuela Caracol does so beautifully: seeing each person for who they are and who they can become.